When using a stock photography service like Shutterstock, follow these general guidelines. While these suggestions primarily apply to Shutterstock, they will be applicable to other services. Have a daily plan to download as many photos as your subscription will allow. Don’t wait until you need images to use your subscription. Instead, be proactive, constantly having images “in the queue” for downloading. Drop the newly downloaded images into category folders to make them easy to find. Additional tips are below. As you’re looking at many different stock images, it can be hard to envision how some might be used or useful. So, it’s important to broaden your creative mind and envision the images in various applications and with modifications you might make. Wide panoramic images are useful for page headers. Square images are useful for profile pictures or Instagram promotions. You can later crop, rotate, and alter photos if needed. The higher resolution photos on Shutterstock could be used to make large prints for artwork or photo prints. With services like Cafe Press, there’s no end to the creative merchandise you can make. Check Your Downloads. Sometimes downloads are incomplete, so be sure to check to make sure all your images have downloaded. Combination Packs. Seek out combination packs by using the Same Model option described below. For example, this collection of exercise photos is sold separately as individual photos. At the normal per picture price, that’s a savings of $350 (eight photos for $50 instead of $400). Or, with the subscription plan, you can download 7 additional photos. Coupon Savings. There are occasionally savings coupon codes you can use to save even more money on a download subscription. To find these, you can do a Google search for “Shutterstock coupon code” (without quotes). Most of the coupon code websites are reputable, but some may not be, so be careful as you explore them and try to stay clear of sites that look questionable. You’re primarily looking for the text code to use at checkout. These can sometimes be good for 20% or 30% off. Daily Download Time Period. It’s important to know your daily download time period. For example, with Shutterstock, the 24-hour period may begin (reset) at 11AM daily. So, you’ll want to be sure to get your entire daily allotment in between 11AM and the following day at 11AM. If you start in the morning, and only get 10 images downloaded before the clock resets, you will have lost 15 images for the day. If you are getting close to the daily cutoff time, you can quickly download the smaller resolution images. These will then be in your account perpetually for future downloads so you can go back later and download all the higher resolution formats. Download 50 Images In A Day. If you’re on a daily plan that permits 25 images per day, by paying attention to the download cutoff time, you’ll notice that you can actually get 50 downloads per day (or at least in a single day) if you download 25 images before your cutoff time and then another 25 images after your cutoff time. This will, of course, use up the available downloads for a 48 hour period (the 24 hours before and after your cutoff time), but for those who want to focus on downloading once every other day, this might be an option. Duplicate Images. Watch out for duplicate images. If you aren’t paying attention, you may inadvertently pay twice for the same (but slightly modified) photo. These may be the same picture cropped, have a decorative border added, or be flipped (a left/right mirror reverse). A landscape photo (wide) will be made into a portrait (tall) photo just by cropping the sides out. Some images are simply the same picture with a different background. You can produce these results on your own in a program that has an instant alpha effect (like Apple Keynote or Adobe Photoshop). You can re-create all of these on your own. Note: Duplicate images may seem like a sneaky way to get you to buy the same image twice. However, for some people these slight image alterations may be difficult, time consuming, and/or would require a skill (or software) they don’t have. Downloading just what they need, and including slight variations of an image may be helpful for some people. Filenames. When organizing (see below) it’s helpful to retain the original downloaded filename. If you begin with the lowest resolution image download first, then each subsequent download will be numbered beginning with 1, 2, 3 etc. increasing to the last download version which will be the highest resolution version. So, when you’re glancing over your downloads you can quickly see which image is the optimal resolution for the project you are working on. Lightbox. Create various groups of images based on different themes. It’s helpful to have each group be 25 photos and download a group a day. If you go over 25, consider deleting the ones you’re not very excited about. Or, with a larger group just remember where you left off. Most Popular. Sort search results with the most popular first. These are typically the best quality, so you’ll save time. Multiple Sizes. You can download the highest resolution image, and then reduce the file size by changing it’s size (in pixels) later using a photo editing program. However, that takes time, and a modified and re-saved JPG image generally loses quality each time it’s modified and saved again (due to file compression). Organizing. Stock photography websites already provide some general categories that will help guide you in organizing your downloads. Sometimes an image may fit multiple categories. In such cases, you can put keywords in the file name or use file tags if your operating system supports that. Photo editing software usually supports tags for organizing photos by category, so using a photo editing program for this purpose can be useful. Places. Most photos and images are generic enough that they can be downloaded and placed into a category folder. Tags can be added if you’re ambitious. However, with images that uniquely depict a location, it’s best to create a folder system that at the top level has Places and then Country > State > City > Landmark. Or, with parks or temples you may want to put the park, temple, or other landmark name directly below the state folder. Product Shots. Some of the images seem to be directly lifted off manufacturer websites and resold. You usually don’t need to pay for promotional product shots since that’s the purpose of the images in the first place, to promote a product. As a formality, and point of assurance, for higher visibility projects you may want to get approval to use an image. Same Model – See All. At the bottom of each image page there’s an option to see all photos with that model. Often this is a good way to discover a collection of photos from the same photo shoot. That’s helpful for creating a consistent look and feel to a website or printed material by having a collection of similar photos. The end result is the same as if you’ve paid to have an entire photo shoot with the same model and photographer. Also, if there’s a picture you like, others with the same model will likely be done by the same photographer and be of equal quality. Additionally, when you look at other photos with the same model, you may find other variations of the photo you had selected that are more preferable. Subscription Plan. 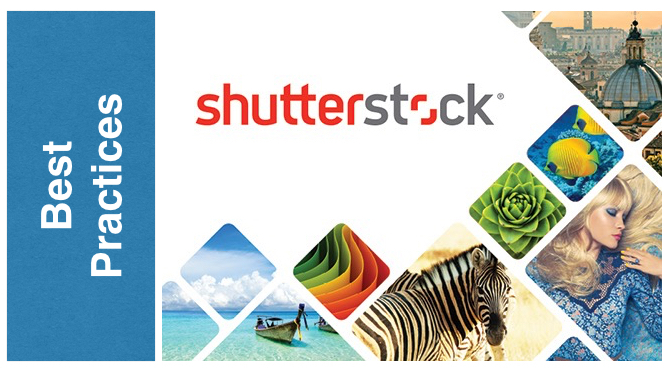 With Shutterstock, the best value seems to be their monthly $250 plan. With it, you can download 25 pictures per day, then skip a few months until you need to refresh your collection. Maintain a wish list or light boxes ready to download the next time you subscribe. You can probably go several months between paid subscriptions. This can save you money over the $2,400 annual subscription plan (also limited to 25 images per day). Take Your Time. Don’t be too quick to buy. As you compile groups of photos based on theme, and compare these different collections, you may find better sets and this will save you from buying and regretting later.